As I was reading the book, I was continually struck by how powerful the idea of true community is, when it comes to getting beyond the frenzy/noise of "the next new thing." Many marketers are rushing around from app to app or tactic to tactic, trying desperately to get noticed in the midst of the maelstrom. Popky builds the case for going back to fundamentals in marketing, using concepts that have been successful since caveman days. Stopping the frenzy. Understand your target audience and their needs. Train and empower your employees to deliver on that message. You can no longer talk "at" your customers. Conversations are the starting point. Yes, we need to participate and engage with customers. But we also need to provide useful content (not marketing hype) to those engaging in conversations. And we need to show up in the communities where our audiences are gathering online and off.” Excerpt From: Linda J. Popky. 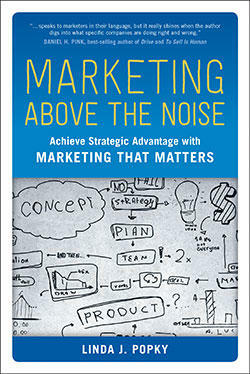 “Marketing Above the Noise.” iBooks. Offer opportunities to meet in person (conferences, Tweetups, etc.). Shared experiences are one of the most powerful ways to connect people. If you're accepting suggestions or feedback, have a process for doing something with the information. Follow up and let the community know when you've taken action on their ideas. Provide useful answers and information, based on your intimate knowledge of your customers' needs. Forget the idea of "command and control." Give your members/customers a reason to feel pride and ownership in the community. Use the data at your fingertips to focus your community. Take the numbers and apply them; don't just pump out reports every week. Internal engagement is as important as external. Don't let the community be a fiefdom that belongs to one person; get everyone from the CEO to the support staff involved. Marketing Above the Noise will be very helpful for anyone who is feeling overwhelmed by the social marketing tools and tactics currently available, and wondering where to begin. This well-written guidebook offers a reminder of marketing basics, and then shows a clear path through the noise to business success.